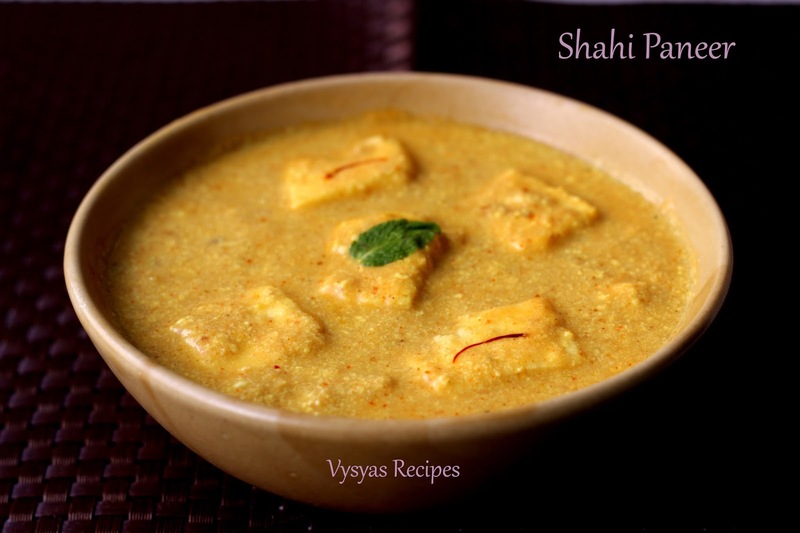 Shahi Paneer is a Popular Punjabi Gravy recipe, simmered in dry fruits Paste & yogurt. 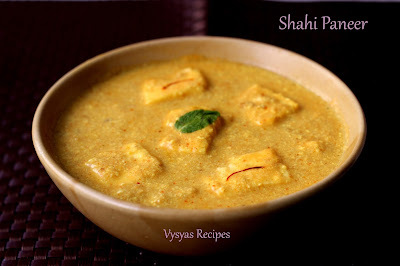 Shahi Means 'Royal', Shahi Paneer is a Royal Rich Gravy made up of dry fruits,Cream,Saffron & some Whole Spices. This Gravy Pairs well with Jeera Rice, Roti,Naan,Phulka's or Chapathi. This Gravy is an Mild,Creamy, Rich Gravy with distinct taste.The taste of this Gravy is So unique when Compared with other Paneer Gravies.Now we will seee the Preparation of Gravy. Crush Ginger- Garlic Paste in a Mortar & Pestle. Soak the saffron strands in warm milk for 15 minutes. In a vessel add Chopped onions,Almonds,Cashews & Green chillies. Add 2 cups of water & boil it for 8 - 10 minutes, till onions turns Soft. Then drain the water completely from it & keep the stock aside. Grind Cooked Onion,Almonds,Cashews & chillies into a fine Puree. Heat the oil or melt the butter, add whole spices such as cinnamon,cloves,cardamom & cumin seeds. Saute till it turns aromatic, add crushed Ginger Garlic Paste,Saute for few minutes till raw smell disappears. Add Ground Onion Paste, add 2 tbsp of water, saute the paste for 5 - 6 minutes, without burning the paste. Add chilli Powder,Coriander Powder, Turmeric Powder,salt. Give a quick mix. Add whisked yogurt, remaining stock. Cook for few minutes, till the gravy thickens. if using cream add it,then add saffron milk. Give a mix. Add Cubed Paneer, let it cook for few minutes 2 minutes in a medium low flame, till the paneer turns soft. Then add Garam Masala, mix well.Cook for 2 more minutes. For Sourness, yogurt is used instead of tomatoes. you can also add melon seeds while boiling almonds,cashews. if using tomatoes add cream, for Good taste. Finally you can add few drops of kewra water for rich aroma. My all time favourite recipe,nice share.